We’d love your help. 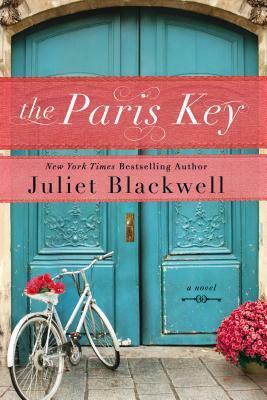 Let us know what’s wrong with this preview of The Paris Key by Juliet Blackwell. As a girl, Genevieve Martin spent the happiest summer of her life in Paris, learning the delicate art of locksmithing at her uncle's side. But since then, living back in the States, she has become mor An American in Paris navigates her family's secret past and unlocks her own future, in this emotionally evocative novel by New York Times bestselling author Juliet Blackwell. To ask other readers questions about The Paris Key, please sign up. What is the language and sexual content of this book? Judie Rated PG. Nothing graphic at all. No bad language that I can think of. It is a charming, lovely book. I loved it. Genevieve's uncle who lived in Paris passed away and since she is getting divorced from her cheating husband, Jason, she decides to go to Paris. Her cousin Catharine asks her to come over and try to sort things out. I really loved that Genevieve went to Paris and she got to see some friends that she couldn't even remember from when she was little. She had spent time over there with her uncle Dave and his wife and he taught her all about being a locksmith! Genevieve always wore a key around her neck as well. She really loved her time in Paris and was upset when she had to come home. Her uncle Dave always used to say, "Remember the locksmiths' code, Genevieve. Never reveal the secrets you find behind locked doors, and never--ever!--abuse the power to open a lock." I was confused several times because the book would go back and forth from the time Genevieve's mom visiting Paris to the time Genevieve was there now and when she was young. The thing with Genevieve's mom Angela is that she died when Genevieve was young and she wanted to learn more about her. But be careful what you wish for . . .
Genevieve also has a brother named Nick but they weren't close. He already knows about the revelations and talks to her about it. I was like, "Hello! Couldn't you have mentioned it sooner!" As soon as Genevieve arrives in uncle Dave's home/work, the doorbell rings and it's an old friend of the family named Philippe. He was so kind and he wanted her to help him with some locks. She put him off but then decided to help, she unlocked many doors. I think it is just so cool to be able to do that with the old houses over there. Genevieve did have a nice time over there. Genevieve met a man named Killian O'Mara. He was a very nice guy and I like to hope they get something together in the future. 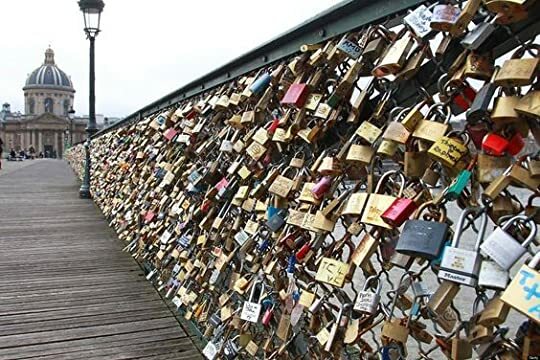 He took her to see the Love Locks Bridge, he wanted to take her picture there her being a locksmith and all. I thought this book was really sweet even though, like I said, I was confused at times. I think re-reading a book like this will give a better understand the next time around. Paris, memories, keys, and family secrets. Genevieve needed to go back to Paris to her uncle's shop not only to get away from her soon-to-be ex-husband, but to take over Uncle Dave's lock and key shop that she had loved as a child. Little did she know that she would find family secrets as well. Genevieve needed to go back to Paris to her uncle's shop not only to get away from her soon-to-be ex-husband, but to take over Uncle Dave's lock and key shop​ that she had loved as a child​. Little did she know that she would find family secrets as well. Both her mother and uncle had passed, but the city held wonderful memories for Genevieve as well as for her mother as we go back and forth in time seeing Angela, Genevieve's mother, in Paris and her uncle who fell in love in Paris and stayed after the war. Her uncle taught her a locksmith's tricks of the trade when she was twelve, and she wanted to try her hand at it again. As her uncle told her all the time, "Locksmiths Laugh At Love and Love Has Its Own Set of Burglar Keys." Genevieve wanted to re-live her times in his shop and to experience Paris as an adult as her mother had done. When Genevieve explores a house where she is fixing locks and finds secret passages from WWII that have a connection to her mother's time in Paris, you will become totally absorbed in the storyline. 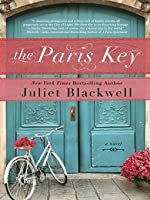 ​THE PARIS KEY ​​has you falling in love with the City of Lights as Ms. Blackwell describes the bakeries, the wine, the cheese, and the people. Ms. Blackwell’s writing style is so intriguing that you feel as though you are right there. And…we can’t have a book about Paris without love. Love that held secrets about her mother and love for Genevieve. I enjoyed THE PARIS KEY and the marvelous way Ms. Blackwell pulls you in with her descriptions and authenticity of the city. While this novel is certainly not my favorite, I really liked it! As a French speaking person, books where there's French and English are always ones that I enjoy, because I get to compare two languages and see how hard it is to do the opposite of what I did, which was learn English. Although I'm not actually French and I've unfortunatelt never been to Paris, I love to read about France in general, because my family comes from there and it sounds beautiful and amazing, except from the rude waite While this novel is certainly not my favorite, I really liked it! As a French speaking person, books where there's French and English are always ones that I enjoy, because I get to compare two languages and see how hard it is to do the opposite of what I did, which was learn English. Although I'm not actually French and I've unfortunatelt never been to Paris, I love to read about France in general, because my family comes from there and it sounds beautiful and amazing, except from the rude waiters, maybe. I liked to see the city through the eyes of someone who struggles with French and who's considering moving altogether to Paris, since moving to another country has always sounded incredible and romantic to me, even though it's way too scary for me to attempt it in a near future. I was relieved to see how Genevieve struggles with immigration and feels like giving up sometimes, because otherwise it wouldn't have been realistic and it would've bugged me the whole time, preventing me from enjoying this novel. The writing style is great. I loved the alternated stories told in different chapters, because I had a better idea of the entire scheme that way. It helped me view the story as it is, instead of clouded by a character's opinion, which I really liked. I think that it could've been told only in Angela and Genevieve's perspectives, because they're the most important characters and their sides of the story are the most different. I enjoyed the intriguing part of this story. There's one plot twist that I saw coming from the very beginning, so I was deceived to see that I had known it all this time and that it was so obvious. However, I remained curious about other parts of the story, which is why I continued reading, anxious and doubting every sentence, trying to figure out the truth. I wasn't expecting to read a mystery book, but it ended up being a little bit like that, which I welcomed happily. The plot is interesting, even though I wish some details were more in depth. Genevieve's divorce seemed very mature to me in the end, because she truly got to know herself better and figure out the reasons behind her actions. I particularly liked seeing her understand her mother, herself and her friends better, because it shows a lot of character development that's well displayed. I would recommend this novel, especially to Paris lovers and locksmiths out there. I picked up this book because I needed something that would be fairly quick to listen to during my commute to and from work this past week. I thought this book sounded kind of interesting, but if I'm being honest with myself I truly decided to read it because I liked the cover. I know. Horrible! After finding out her husband has been having an affair, Genevieve decides to move to Paris to take over her recently deceased uncle's locksmith shop. Her aunt, who suffers from Alzheimer's, thinks Genev I picked up this book because I needed something that would be fairly quick to listen to during my commute to and from work this past week. I thought this book sounded kind of interesting, but if I'm being honest with myself I truly decided to read it because I liked the cover. I know. Horrible! After finding out her husband has been having an affair, Genevieve decides to move to Paris to take over her recently deceased uncle's locksmith shop. Her aunt, who suffers from Alzheimer's, thinks Genevieve is her mother, Angela, and makes a statement that leaves Genevieve wondering what happened to her mother during a sporadic trip to Paris more than 30 years ago. Sometimes our parents aren't who we thought they were. Sometimes they leave us before we have a chance to know them as people and individuals instead of as our parents. 3 stars. I liked the characters in this story. I also liked that the story had different threads to follow. I think sometimes they needed a little more depth. But even with that being said, some of the scenes were written so well, I felt I was actually there watching it. I think the depth I wanted was with the characters and how they got from point A to point B. There seemed to be an awful lot of leaping over given facts, which then always resulted in long wordy explanations to explain what just happened. Overall, I did care about the characters and the outcome...so 3 stars. A bit too predictable for my taste. The writing is beautiful, however, it's like exploring Paris yourself and this book makes me want to go there. Oh, how I wish there are twist and turns, the book would be much more interesting. The clues are just too big, as a book about a woman trying to uncover the family's past, this book is far from mysterious. I loved "The Paris Key". A few elements in the approach kept the book from reaching full-fledged éclat. I enjoyed Juliet's capable venture into standard adult fiction. She could burst out from the "cozy genre" bonds more boldly and needn't have translated obvious French words but wrote a fine novel. I merely loathe synopsises that dramatically tout discoveries purportedly "reshaping the history of a family, forever!" These revelations solely concern Angel's 1983 summer. Something more ancient or I loved "The Paris Key". A few elements in the approach kept the book from reaching full-fledged éclat. I enjoyed Juliet's capable venture into standard adult fiction. She could burst out from the "cozy genre" bonds more boldly and needn't have translated obvious French words but wrote a fine novel. I merely loathe synopsises that dramatically tout discoveries purportedly "reshaping the history of a family, forever!" These revelations solely concern Angel's 1983 summer. Something more ancient or at least ancestrally far-reaching could have sparkled. What Juliet chose as secrets could be scintillating but she needed to build drama into the one that we easily know long before Genevieve does. A background event that comprises another secret needed to be foreshadowed or discussed by neighbours, to germinate into something meaningful to readers and become a much more explosive revelation than it was. It is a one-time political incident that has no potency for us because it is not presented until we glimpse it taking place near the end. It is worth bolstering suspense by tidying-up the telling: generating that éclat, abbreviating food descriptions, and divorce musing. Ooh I loved this ... falling in love with a cover paid off this time. Why I loved it? ... just because. Does that cut it? It's a story that spoke to me for no one reason I can put my finger on ... it just did. 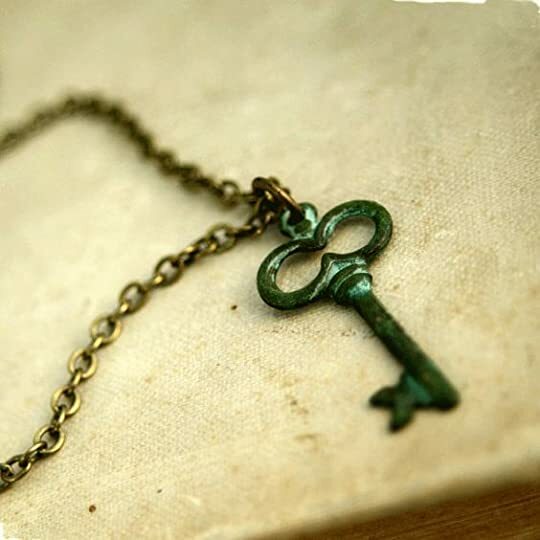 ... "there is something delightful about helping a key find its way back to a lock, so it can do the work it was meant for. " "Are you going to let yourself be defeated by a little lock? Remember Genevieve: Love laughs at locksmiths! Trust your old uncle." The story moves seamlessly from Gene Ooh I loved this ... falling in love with a cover paid off this time. The story moves seamlessly from Genevieve in the present day to her time in Paris as a teenager staying with uncle Dave and tante Pasquale, to her mother Angela's bittersweet time in Paris. I was captivated by it all. 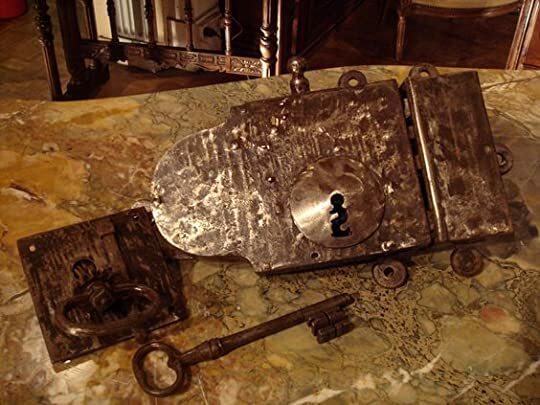 I loved the symbolism ... secrets, locks ... opening your heart to new experiences, life and love. All the talk about boulangerie's, baguette's, pain au chocolat had me longing once more for Paris. The story felt like Paris ... that beguiling mix of old fashioned values and sophistication, lingering over conversations, good food and wine, enjoying simple pleasures. Walking in Paris with Genevieve felt intimate, discovering along with her, places I've visited and some I'm adding to the bucket list ... Village Saint-Paul, Montparnasse cemetry, Le Pont Traversé (the old butcher's bookshop.) I loved her interactions in Paris, her struggles with French bureaucracy and efforts to learn the language. I adored Genevieve's Parisian friend Sylviane. I could read a book about her ... how 'bout it Juliet? The Paris Key is a story about secrets, family, friends and discovering one's true self ... in Paris. It's warm and touching and delightful. Really good book! I have found a new author. I like stories set in two time lines, two characters, two cities. This ticked all the boxes. Alternately the story of Angela (mother) and Genevieve (daughter) set in America and Paris and in two distinct time frames made for a evocative, emotional, beautiful story. On the death of her mother and uncle, Genevieve returns to Paris to try to organise her life, her thoughts and her future. With an interest in the art of locksmiths and a natural talent for it, she takes over her late uncle's shop in t I like stories set in two time lines, two characters, two cities. This ticked all the boxes. Alternately the story of Angela (mother) and Genevieve (daughter) set in America and Paris and in two distinct time frames made for a evocative, emotional, beautiful story. On the death of her mother and uncle, Genevieve returns to Paris to try to organise her life, her thoughts and her future. With an interest in the art of locksmiths and a natural talent for it, she takes over her late uncle's shop in the heart of Paris and tries to sort out what she needs to do next. Her marriage to Jason is obviously over, and she is very unsettled as to why her mother behaved the way she did. She knows there are secrets but with her father dead and her brother oblivious to the more emotional parts of her parents lives, she knows she has to try to ferret out what she feels was some hidden mystery and begin to be at peace with herself. What she unravels is something much bigger than she would have imagined and several unexplained mysteries in her life become much clearer. I found this book to be rather boring, predictable, and disappointing. The writing however in which Paris is described is absolutely beautiful, so much so that I could almost imagine walking the streets of Paris myself. The writing and visual descriptions of Paris were nice, but not much seemed to be happening throughout the majority of the book and the cliff hanger was pretty obvious early on. Why did I spend so much time reading a book where nothing has happened? Blackwell does a really good job covering up her lack of plot with beautiful settings and great characterization. And why did we need all the flashbacks to the mom? Oh, that's right: the most predictable ending in literary history. I wanted to love this book, because I love books set in Paris. I fell in instalove with the cover and couldn't wait to just get swept off my feet. But between a narrator that was really quite dull and repetitive descriptions, I was ready to sweep this one into the trash. But I kept trying to persist through it, but lately every time I hit play I made an excuse to turn it off. Very good book. This author is quickly becoming a favorite of mine. She does great research for her books. If you haven’t read her witchy series, give it a go. I love reading books about France and mysteries especially. Really enjoyable book about a women escaping to Paris just like she did as a child. Love the locksmith setting and the charm of a neighborhood in Paris. Breathtaking. If I could rate it more than five stars, I would. Juliet Blackwell is such a consistently good author. I had originally read her Art Lover's Mystery series of books. The co-author of those books was Blackwell's sister, who also happened to be one of my daughter's college teachers. Anyway, those four mysteries, under the name of Hailey Lind, were a lot of fun. This book was a lot of fun, too! Genevieve (what a gorgeous French pronunciation is included in the story!) and her husband Jason are divorcing, so Genevieve decides to go to Paris to possi Juliet Blackwell is such a consistently good author. I had originally read her Art Lover's Mystery series of books. The co-author of those books was Blackwell's sister, who also happened to be one of my daughter's college teachers. Anyway, those four mysteries, under the name of Hailey Lind, were a lot of fun. This book was a lot of fun, too! Genevieve (what a gorgeous French pronunciation is included in the story!) and her husband Jason are divorcing, so Genevieve decides to go to Paris to possibly take over her uncle's locksmith shop. He has recently passed on, and she had very fond memories of him and Paris when she was a young teenager. She had gone there after her mother had died, and Uncle Dave had ended up teaching her the art of being a locksmith. I loved the characters in the story - they are all individuals and well drawn, and very believable. Genevieve discovers some things about her past there, and also ends up becoming more of who she was meant to be. I thoroughly enjoyed this audio book. Brought back wonderful memories of my visit to Paris a few years ago and really made me want to be there. Good story and characters. And in listening to this book, I learned the correct way to pronounce "Genevieve." I've been pronouncing wrong all these years and the correct way sounds beautiful!! I thought the narration was very well done. I love the book. You have to understand that my cousin's wife is Parisian, and I have a cousin on my maternal grandfather's side that has lived in France for decades. She was a club singer and owns a music company called French Fried Music. The stories I've heard about life in Paris come alive in this book. All in all, it was a great book well written; one I'll read again someday when I need to visit Paris in my mind. Juliet Blackwell has yet to write a book I haven't thoroughly enjoyed. Hardly a masterpiece or an eternal classic, this does however manage to be a truly charming read, with some very accurate and deliciously real descriptions of Paris and its inhabitants that made me personally somewhat nostalgic. The unusual topic - keys and locksmiths - was what drew me to this one, along with yes Paris. i wont go into a description of story and characters, there's plenty here and much better than what i could pull off, but i can most certainly tell you that Ms. Blackwell was succ Hardly a masterpiece or an eternal classic, this does however manage to be a truly charming read, with some very accurate and deliciously real descriptions of Paris and its inhabitants that made me personally somewhat nostalgic. i wont go into a description of story and characters, there's plenty here and much better than what i could pull off, but i can most certainly tell you that Ms. Blackwell was successful in transporting me back to a lovely summer break. Anyone who has visited Paris, however briefly will enjoy this one - the colors, the sights, the smells of that city are so real and vivid in these pages that i'm yearning for a trip back! the idiosyncrasies that make Parisians so..ahem...unique and unforgettable, jump from the page and make fully excuse the less than perfect prose and the occasional wish to slap some common sense into our leading lady Genevieve...i know, one must be patient and allow her to complete her journey (even if one is capable of guessing how to whole thing will end after oh...35 pages?). anyways, this is probably one of the finest examples of guilty pleasure chick lit I've read in a long time....highly recommend it for a cozy day in away from the cold or a summer afternoon at the beach! Took me a bit to become engrossed in the story, once I did I took my time and enjoyed it. I gave this book 3 stars (which is low for me...I usually don't finish books that I wouldn't call a 4 or 5) for two simple reasons. 1. It perpetuates the simplistic American view of Paris and France in general. Visits to the quaint local baker for baguettes in the morning (although knowing what French packaged bread is like, you're stupid to not buy it fresh). Fashionable women on every corner. Endless bureaucracy (ok that part is true). Paris is like New York; a huge metropolitan city with a div I gave this book 3 stars (which is low for me...I usually don't finish books that I wouldn't call a 4 or 5) for two simple reasons. 1. It perpetuates the simplistic American view of Paris and France in general. Visits to the quaint local baker for baguettes in the morning (although knowing what French packaged bread is like, you're stupid to not buy it fresh). Fashionable women on every corner. Endless bureaucracy (ok that part is true). Paris is like New York; a huge metropolitan city with a diverse population. Yet it seems to me that Americans especially tend to picture NYC as constantly changing and yet Paris stays the same as it was back in the early 1900s. While Parisian architecture has thankfully remained moderately unchanged (and by that I mean they haven't bulldozed all the old buildings down to make way for high-rise luxury apartments), the character of the city isn't as simplistic as this book makes it out to be. 2. The "French speak" that is used in this book frustrated me to no end. The French speakers were able to correctly communicate complicated and long-winded thoughts, but when it came to something easy to say, the author wrote things in broken English or simply substituted a French cliché like "très bien" or "c'est magnifique". So I really thought hard about this....maybe the characters would speak in English+cliché phrase because they knew that almost all english speakers know the meanings of those phrases, so they were one less thing they had to say in English. OR maybe, since they are the few things that almost every reader of this book would know they were put in for that realistic slice of Parisian life. Either way, the inconsistency bothered me. I dabble in French and I can tell you that I have a much easier time saying "très bien" and talking about simple things when I need to than explaining war or dreams or interpreting cemetery sculptures like characters in this book did. I’m a longtime fan of Juliet Blackwell’s cozy mysteries, so I was excited about her first foray into mainstream fiction. THE PARIS KEY is a poignant story about family secrets, loss, moving forward, and, of course, the beauty of Paris. The story is told from the point of view of two women, Genevieve and her mother, Angela, in different time periods. Paris has been a refuge for them both, especially to Genevieve, first after her mother’s death, and now at the end of her marriage. Angela briefly le I’m a longtime fan of Juliet Blackwell’s cozy mysteries, so I was excited about her first foray into mainstream fiction. 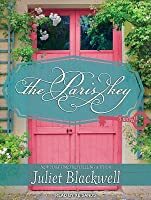 THE PARIS KEY is a poignant story about family secrets, loss, moving forward, and, of course, the beauty of Paris. The story is told from the point of view of two women, Genevieve and her mother, Angela, in different time periods. Paris has been a refuge for them both, especially to Genevieve, first after her mother’s death, and now at the end of her marriage. Angela briefly left her family and fled to Paris many years earlier, and Genevieve was in for quite a shock at what went on during her mother’s stay. It’s hard to keep secrets buried, even ones locked away in the abandoned tunnels below Paris. The author’s rich descriptions of life in Paris drew me in – the culture, food, people, and interesting sights. I especially loved that the author made Genevieve’s experiences as an American in Paris realistic. She struggled with the language, some customs, and the bureaucracy, but in the end, it was all worth it. THE PARIS KEY is a lovely story about a woman coming to terms with her mother’s past and reinventing herself in the process, sure to delight fans of contemporary women’s fiction. The cover makes this book look like a Hallmark Christmas in July kind of movie, like where the heroine moves back to her hometown and meets her honest boyfriend from high school, the guy who drives a pickup truck and is, like, a carpenter who harvests his own wood and makes his own wildly popular coffee ("I'ts my passion," he says seriously while looking at her over the top of his mug). But this book isn't really like that. It's about a woman who's separated from her husband who cheated, and she The cover makes this book look like a Hallmark Christmas in July kind of movie, like where the heroine moves back to her hometown and meets her honest boyfriend from high school, the guy who drives a pickup truck and is, like, a carpenter who harvests his own wood and makes his own wildly popular coffee ("I'ts my passion," he says seriously while looking at her over the top of his mug). But this book isn't really like that. It's about a woman who's separated from her husband who cheated, and she decides to go to Paris and run her late uncle's key shop. I give the author a lot of credit for taking the ex above the jerk stereotype. Yeah, he cheated--but she also realizes she wanted to leave the relationship a while ago (and bonus points to the author for making jokes about his "life coach"--very Bay Area, very funny). The key shop and its attendant village within Paris is all very charming without being too tote adorbs.